I told my mom about this crazy capsule wardrobe idea the other night. It didn’t seem to phase her. This idea rocked my world and knocked my socks off. “37 sounds like a lot of clothes” she said. I quickly asked her how many items she had in her closet. She didn’t know of course, but her closet is about three times bigger than mine. It’s just as packed as my closet was and she also uses another closet in the house. I also shared with her my new mantra of “spending is not saving” She gave me a confused “Duh!” but she’s where I got all my clothes hoarding habits from. 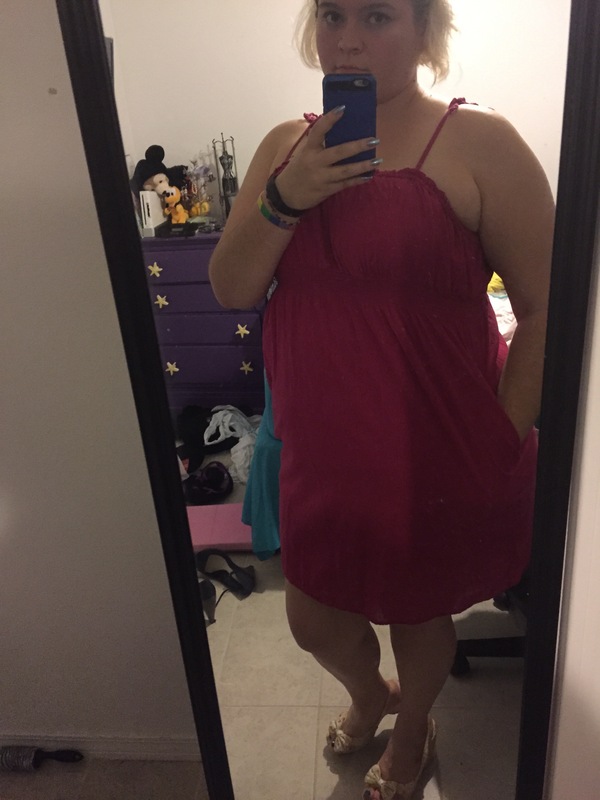 I felt really great after getting my shirts down to 61 items. However, I’ve done laundry since then and a few more shirts have definitely made it back in. But they’re all clothes I like to wear. At one point I even hung up a shirt that I know I’m going to put in a box for next year’s spring capsule. Today I’ll probably go through my second closet. Pull out a bunch of dresses, skirts, and cardigans I don’t wear or need. When I first started thinking about doing a capsule wardrobe, I made up a collection with items similar to ones I own on polyvore so I could mix and match to my hearts content and see if I had a good idea for a capsule together. You can check that out here. I’ve found that even on polyvore there are items I skip over. I think it all boils down to the fact that I’m letting other people’s capsules influence my own instead of finding my own 37 items. For instance, dresses are not my favorite, yet I included two in my capsule. I love the idea of my pink dress. 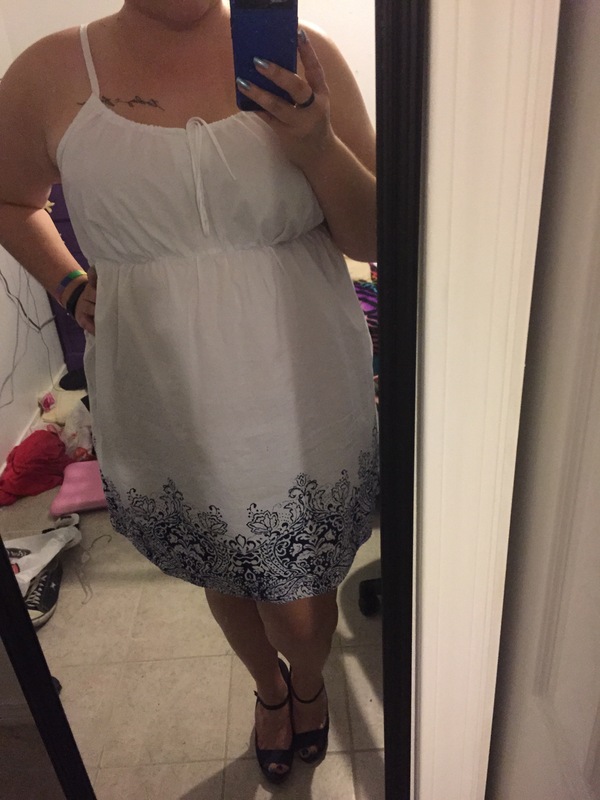 It’s a cute color, it’s plain so it’s easy to put other pieces with it, and it has pockets. I absolutely love that it has pockets. But once it’s on I have problems with it. It’s too tight around my thighs, my phone and car keys weigh the pockets down too much and make it feel awkward. I have to wear a cardigan with it or show my bra straps. Regardless I think both dresses I picked will make it into my final capsule, because there are days when I want to wear a dress, and even if I don’t wear them all summer, I’ll feel better knowing I had them just in case. Plus I look awesome in both of them. One issue I have with my practice capsule is that I included my Fourth of July outfit. I’ve got a cute outfit planned for the Fourth, even if I don’t end up doing anything, I’m prepared. However, I don’t feel like I’ll get much use out of the items other than on the Fourth. I’m thinking I might leave it out of the capsule. It’s something I’ll have to think about. My other issue comes with my jackets I’ve included. I’ve included two lightweight hoodies, for going to the movies, walking on the beach at night, and sunburns. I’m not sure if any of these things will happen over summer, but I think I will leave them out of my count. I have several cardigans in my capsule that I will count, because they will be a thought out part of an outfit, my hoodies will be added on as an afterthought if I’m cold. Along the same lines of dresses, I also don’t tend to wear skirts. Yet, I’ve included three. One of which I wear as a dress. I know there is so much you can do with a skirt, I just don’t know how to do them. I also hate the lack of pockets. I don’t own a single skirt with pockets. But I always want a pocket. I feel awkward if I don’t have a pocket for any amount of time. Where do I put my phone? My car keys? Funnily enough, one of my other problems was simply not knowing what I had. With all the clothes I had, things easily get lost. (I’m still looking for a black v-neck shirt that went missing Valentine’s day circa 2013) What this means is, I made this collection before I cleaned out my closet. Now that I’ve cleaned out my closet and finished doing all my laundry, I’ve found a few nice summery shirts that I want to add to my capsule. To make this work, a few things have to be shifted around. My summer capsule is going to take a little more time. But I’m excited for the process. I’m really enjoying following along with your process of building a capsule wardrobe! I want to do one or work thru the process myself, but so many of the websites are so “perfect” or something. Thanks for being real and sharing your experience? Thank you so much for the kind words! I’ve noticed how “perfect” the other blogs are too. They seem to know exactly what they’re doing, and have fancy pictures to go with everything. I’ve also noticed that they don’t share their first capsule with the readers. Most of the time it seems like they tried it out to see if it would work first, figured out what they needed to do for a more successful capsule, and then showed everything off and it looks perfect. I want to share my entire experience with everyone. I want to be able to tell my readers what did and didn’t work for me. I want to be real. From my messy room in the background of my pictures to my iPhone selfies with subpar lighting. I hope you continue to enjoy reading through my experience.